Omnichannel marketing is a way of engaging customers using a variety of touchpoints ranging from text, voice, video, chat, social media and email. This strategy helps to create a seamless user experience that aims to build customer loyalty. With technology constantly evolving, the need for targeting customers via a wide range of integrated touchpoints has become essential for offering personalized customer service and shopping experiences. 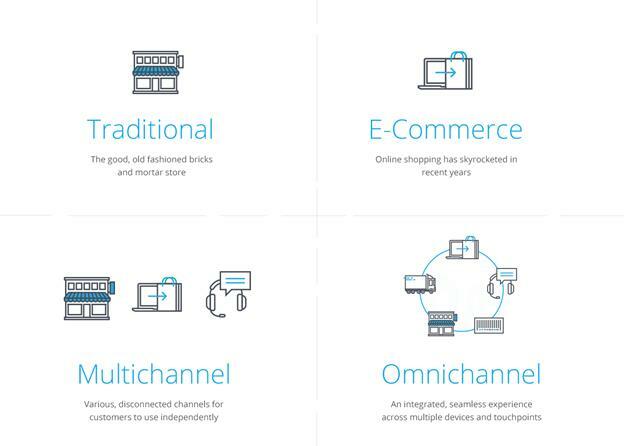 User experience has evolved from traditional to e-commerce, then multi-channel and now omnichannel, as depicted in the image below. According to Worldpay, omnichannel shoppers spend around 50 to 300 percent more than traditional shoppers. Merchants can act on the revenue potential, keeping these numbers in mind, by employing strategies across several departments and by leveraging consumer information that is collected during the various channel interactions. By integrating customer information, companies can personalize the user experience, establish long-term customer loyalty and simplify marketing workflows. Developing an omnichannel strategy can be broken down into four steps: evaluate product portfolio for complexity, map out customer journeys, match buying phases with respective channels and proactively address channel conflict. By evaluating the product portfolio for complexity, and defining the points in buying cycles can increase the end value of sale. Mapping out customer journeys and tracing the buying behaviors from in store to online helps to understand customer preferences. By understanding the best channels for the customer buying stage, companies can pinpoint when interest turns to serious consideration for purchase and capitalize on this. Finally, addressing channel conflict can avoid uncertainty, doubt and frustration for customers and salespersons. With the demand of omnichannel engagement increasing, technology advancements are emerging, creating more sophisticated interactions between the customer and the merchant possible. The omnichannel concept is resonating strongly with companies as they are seeing the reflection of growing revenues and margins in their competition.